CDP Systems Corp. has 25-year history of the work in the field of femtosecond technology, ultra-fast spectroscopy, and near-field scanning optical microscopy. 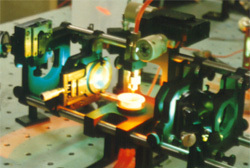 In July 1988 we reported first femtosecond multipass dye amplifer and commercialized this approach in a device operating together with a colliding-pulse mode-locking dye oscillator. We successfully use that two-mirror amplifier configuration in the MPA 50 multipass Ti: sapphire amplifier system. With the TISSA 20 seed laser it gives efficient amplification of < 40 fs pulses at 1 kHz pulse repetition rate. Our MPA-XL two-stage terawatt amplifier system gives 0.2 J pulse energy at 10 Hz pulse repetition rate. FOG100 fluorescence upconversion system and ExciPro transient absorption pump-probe system are the first professional turnkey femtosecond spectroscopy systems that give a possibility to get scientific results immediately after installation.